Non enveloped, turreted virion with a T=2* icosahedral symmetry, about 49-50 nm in diameter. 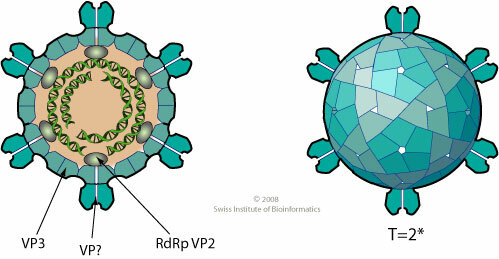 The capsid is composed of only a single shell of protein. Segmented linear dsRNA genome. Contains 9 segments encoding for at least 9 proteins. NATURAL HOSTS Unknown. Replicates in a variety of mosquito cell lines.